Born and based in Dubai, Zeinab Alhashemi is a conceptual artist and designer specializing in site-specific installation and spatial art. Her process forges a connection between an honored tradition and distinguished contemporary pieces by collaborating with artisans and craftsmen. She works to inform the execution through a process of exploration. By deconstructing and reconstructing her chosen medium, she gives viewers a different perspective on the landscape in which they are situated. Her practice focuses often in response to her immediate surroundings. Her research revolves around the past and history of her environment, documenting the process of change through her perception and the state from “What is’ to “What could be,” only this time it’s not the history it holds, but also the story she tells. Alhashemi executes visionary art through raw and overlooked materials. Her personal journey is to understand her identity, the world around her, and the universal symbols that shape our reality. Her execution with form reflects the connection between nature and the industrial, through implementing sacred geometry consciousness in the work. 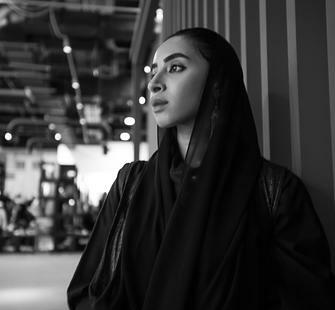 Alhashemi supports the importance of public art, and is always keen to engage the public with her work. She believes that it is her responsibility as an artist to draw awareness not only to art and design, but to how it can inspire society.